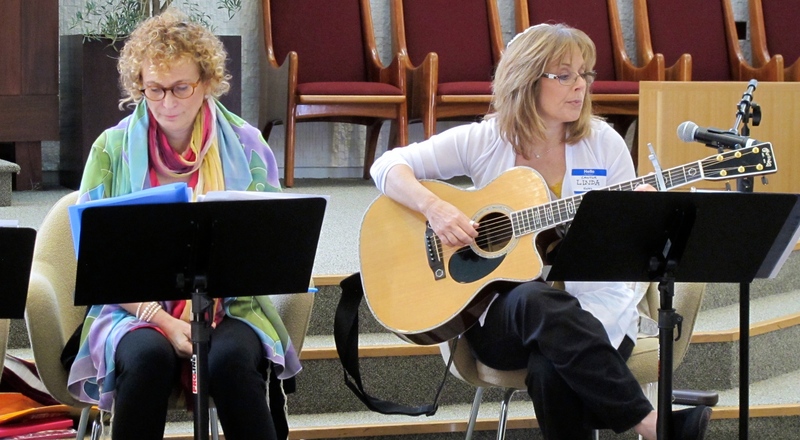 At our beautiful all-day retreat last Shabbat, “A Mindful Journey Through Shabbat” we did a morning of chant/kavannah/music/silence. As leaders, we chose several key prayers (only a few) from the morning Shabbat service and went deeper into each one. For example, we started with Modah/Modeh Ani, which means “Grateful/Thankful am I” and offered a brief reflection on the meaning of that prayer, followed by a suggested kavannah (intention). We chose specific music that was soulful and simple to follow, usually using one verse only. Also, every bit of Hebrew we used was transliterated and translated so that people could easily join in and yet, everything we prayed in Hebrew was also written in Hebrew script so that those who read Hebrew could also do so. After we sang the music selection together, we sat in silence for around 3-5 minutes, just absorbing the reverberations of sound and melody with the words from the kavannah also resonating. Our primary goal was that the two hours we spent in prayer be heart-opening. The design of the service was absolutely deliberate in its simplicity and intention. We felt that “less was more” and that “deeper was more important than breadth.” We wanted the experience to feel spacious and unrushed. We wanted people to feel welcome no matter their level of Jewish practice and experience. We wanted the music to open people’s hearts and we wanted the words we created for the kavannot to be easily related to and so we wove in stories from our own lives. We knew that poetry was another way “in” for many people as it speaks to the non-linear part of our brains and so we selected meaningful poetry as well. We wanted to talk about the “G” word (God) in a way that was expansive as that word is only a metaphor pointing to something that is difficult to describe in words for many of us. The philosophy behind this kind of prayer experience represents a radical shift in what most people experience at synagogue. Too many times people feel left out, or overwhelmed or not sure how to enter in. Too many people sit there thinking that “everyone else gets ‘it’ and I don’t.” Too many of us leave feeling alienated and that is a shame. The truth is that there is enormous depth and meaning in most of our prayers – and as someone who became Jewishly “literate” as an adult – I did not grow up knowing that. I didn’t even know the questions to ask. I did not connect to services. It did not help me to be told “just keep going and you’ll find it meaningful.” I wasn’t going to recite prayers if I didn’t know what they meant. I wanted singable music so I that I could participate. to my bouts of childhood whining. I can’t find my other sneaker. There’s no one to play with this early. My bicycle only has three gears. growing up on a farm in Ontario, Canada. Nor did she have much Canada in her voice. Fall to your knees and thank God for your eyesight, aye? was not heard in the hallways of our house. in the doorway and pinned me to the floor with that look. for giving me the eyes to see the world, to regard these words. Sounds like a wonderful day! Thank you Jill especially for sharing the poetry…they build on each other and The Journey by Mary Oliver, WOW, really hits deeply.